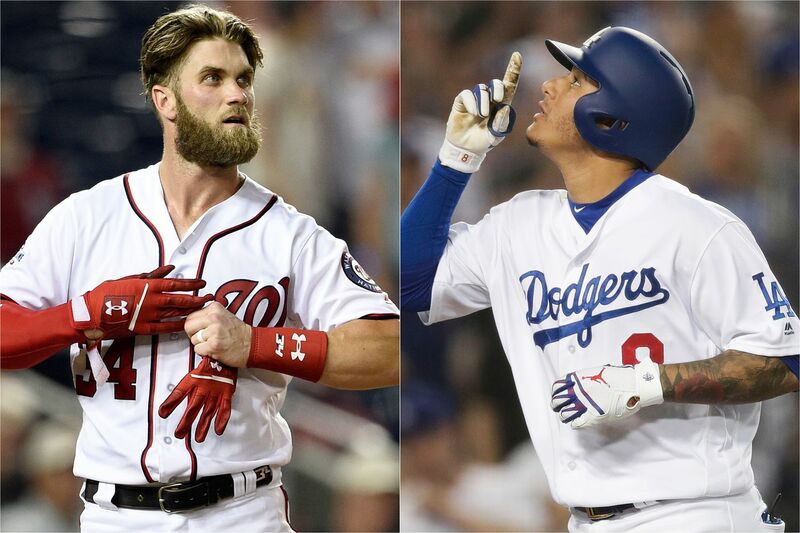 Washington Nationals star Bryce Harper (left) and Los Angeles Dodgers star Manny Machado (right) are likely to be free agent targets for the Phillies this winter. John Middleton is ready to make it rain. That's been the presumption, at least, across baseball for the past few months. Even before the Phillies made a historic seven-week free fall from playoff contention, their billionaire owner appeared to be itching to unholster his wallet, according to gossiping officials from multiple rival teams, and go on a shopping spree in a free-agent market that will be rife with marquee names. With less than $70 million in payroll commitments for next year, the Phillies have the wherewithal to play in the deep end. And given the way the season is ending — with the losses mounting and interest in the team stagnating — Middleton seemingly has even more motivation to splash away. Make no mistake, then, that the Phillies will be in the mix for Manny Machado. Bryce Harper, too. But which superstar do they prefer? Who would be the best fit? Gabe Kapler might have already tipped his hand. Two weeks ago, after the Phillies wrapped up their season series against the Washington Nationals, the manager — without being asked — said Harper "might be the best player in baseball." And while some have speculated that the Nationals will re-sign the face of their franchise, it's also easy to imagine them moving forward with a young outfield of Juan Soto, Adam Eaton, and top prospect Victor Robles. The Phillies have long been linked to Machado, in part because team president Andy MacPhail, general manager Matt Klentak, and assistant GM Ned Rice were working for the Baltimore Orioles when they drafted Machado eight years ago. The Phils pursued the star shortstop at the trade deadline, too, and likely would have given up prized pitching prospect Adonis Medina if Machado was willing to sign a contract extension. Reasons abound for the Phillies to lust after either Harper or Machado. But there are also reasons for pause. We solicited the opinions of five rival scouts and executives, asking them to compare Harper and Machado based on three factors: pure talent, durability/longevity, and overall fit within a clubhouse. Three said they'd rather have Machado; two preferred Harper. "They're both impact talents," one NL scout said, "probably as good as ever to hit the free-agent market at this age." Proponents of Machado point to his defense as the skill that separates him from Harper and the reason to sign him. And given the Phillies' extreme need to improve defensively, they might wind up agreeing. Machado was a two-time Gold Glove third baseman before the Orioles agreed to let him move back to his natural position of shortstop this season. And although he wants to stay at short, one NL executive suggested that Machado's long-term future remains at third base. "Somebody might put him at short for a couple of years, entice him that way, but the fact of the matter is, he's a Gold Glove-caliber third baseman," the executive said. "Is he as good as [Nolan] Arenado? Maybe not, because Arenado is extraordinary. But he's close. I know Bryce is a very talented guy, but I just don't see him becoming that Gold Glove-caliber type of defender, and that's a little bit of a separator for me." One AL scout concurred, predicting that Machado will be signed as a shortstop initially but will move to third base sooner rather than later and will "retain more value than Harper" because of his superior defense. Harper supporters point to his sheer impact at the plate and on the bases. He's had two seasons with a 1.000 OPS (Machado's career high is .963). At a time when many teams, including the Phillies under Kapler, prioritize seeing a lot of pitches, high on-base skills, and prodigious power at the expense of strikeouts, Harper checks all of those boxes. Since 2015, Harper ranks second in the majors in walks, fourth in on-base percentage, ninth in both home runs and slugging, fourth in OPS, and 22nd in strikeouts. "Harper will give you a better effort, day in and day out," said the NL scout. "I think once Manny gets his money, he's going to coast more than the other guy is." It's rare in the post-steroid era that a player holds up, health-wise, for the duration of a seven-, eight-, or 10-year contract. Just look at Albert Pujols. And Miguel Cabrera. But it's equally rare that players reach free agency at such a young age as these two. Harper will turn 26 next month; Machado won't be 27 until next July. "I think that's why people are expecting the numbers to be so big on these two guys," said the NL scout, referring to industry predictions that both Machado and Harper will sign contacts in excess of $300 million, "because of how young they are." That doesn't mean, however, that suitors for Machado and Harper will ignore issues of durability and longevity. Machado had surgery on his left knee in 2013 and his right knee a year later, injuries that reportedly left the Orioles unwilling to sign him to a long-term extension. Harper has endured knee and thumb problems and plays so hard that some scouts fear he's more of an injury risk as he gets older. "Machado has more efficient movements, both hitting and defensively," said one AL executive. "I'd assign a slightly lower health risk to him than Harper." Overall, though, it seems neither player's health is a particularly big concern. Harper has never played fewer than 100 games in a season and has averaged 142 games per year since 2015. Machado has averaged 158 games per season over the last four years. And unlike Cabrera and Pujols, they are decent bets to maintain their health for a large portion of their contract. Cabrera was 31 in 2014 when he signed an eight-year contract extension, a deal that is now weighing down the Detroit Tigers' rebuilding. Pujols was 31 in 2011 when he signed a 10-year contract with the Los Angeles Angels as a free agent. "It's less pressing, but it does make a difference when it comes to being an impact player on both sides of the field," the NL executive said. "I just feel like I would put my money more on Machado than I would on Harper, just because I think I've already seen signs of Harper going not backwards but kind of leveling off defensively. I see Machado just continuing to be really good." One AL scout who prefers Machado said "something about Harper's personality gives me pause." The aforementioned NL scout believes Harper has a better chance of carrying a team through tough times, while "Manny's not going to come in and be a leader. He's not a guy who lifts you." "I think both of them are selfish," the NL scout continued, "but a lot of times, great players are selfish." But it's worth considering how each player might fit into the Phillies' clubhouse. In hindsight, Phillies officials have allowed that the team's chemistry might have been impacted when Klentak made six deals in July and August. And none of the players that he acquired possesses anything close to the star power of Machado and Harper. Harper is one of the most recognizable names and faces in the sport, a fact that agent Scott Boras is likely to use as a selling point when he speaks directly with owners, as he likes to do in negotiations with high-profile free agents. If Middleton is looking to sign a megastar, it's difficult to top Harper, who likely will attract fans interested in simply watching his four plate appearances per game. Here, though, is the flip side to that sort of acquisition: "Signing Harper makes him the face of the franchise, hard stop," said the AL executive." In other words, everything — and everyone — would revolve around him, which could be a challenge for a team as young as the Phillies that features emerging homegrown stars in ace Aaron Nola and slugger Rhys Hoskins. Machado would be a "very high-profile figure in the franchise," as the executive said, by virtue of his contract and his ability, but not likely to the same degree as Harper. Machado also would seemingly blend in with the Phillies' large population of Spanish-speaking players. "No matter which guy you sign," the NL scout said, "they're both going to have huge impacts." Or maybe the Phillies should just wait and see if the Angels ever decide to trade Mike Trout?